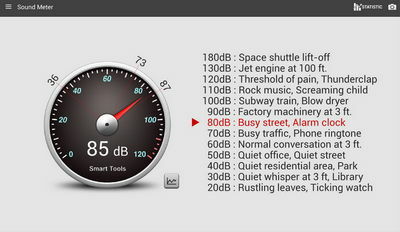 Measure sound pressure (noise) and vibrations (earthquakes for instance) easily with your Android device. Made by the creators of Smart Tools, Sound Meter Pro offers an unmatched SNL (sound pressure level) and Vibrometer for anyone interested in those tools. Although not as good as a dedicated hardware sound meter, and even though restricted by Android limitations, this app delivers good results if used as an auxiliary and reference tool. About the Vibrometer: The measured values are related to Modified Mercalli Intensity scale (MMI). If it is inaccurate, you can calibrate it so that maximum value is about 10-11.